Venturing into Olneyville last week, a friend and I were pleasantly surprised by our experience at Fête (pronounced /’fet/). We were there to see Assembly of Dust, a folk/Americana band from NYC, and Leftover Salmon, a bluegrass act from Boulder, Colo., and we were excited to try out the new club on the West Side of Providence. After a tasty meal at El Rancho Grande on nearby Plainfield Street, we made a short 1 mile trip over to Fête. Valet parking is offered and was a must on this evening as on-street parking was hard to find. As advertised, the show started right up at 7:30 pm with Assembly of Dust playing first. Assembly of Dust plays with a lyric-driven style that blends three-part harmonies with next generation Americana. Unobstructed views of the stage create a nice viewing experience from virtually all angles. The blend of steel construction and artwork in the space is highlighted by the creative lighting features which change color as the band plays. 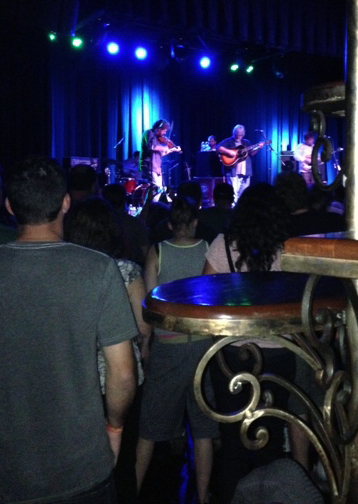 Leftover Salmon came on next and launched into some classic bluegrass, which really got the crowd going. The up-tempo blend of country, bluegrass, and rock really creates a fun dance scene in front of the stage that the diverse crowd lapped up. Overall, Fête is a great new venue that I highly recommend you visit! To see upcoming shows or to learn more about Fête, check out their website here. A tourism expert by profession and a traveling spirit by nature, Christopher is passionate about experiencing new places, and all things Providence. A married father of four amazing kids, he enjoys spending time with his family at the beach in Little Compton, R.I. Christopher is the Director of Sales at the Providence Warwick Convention & Visitors Bureau.